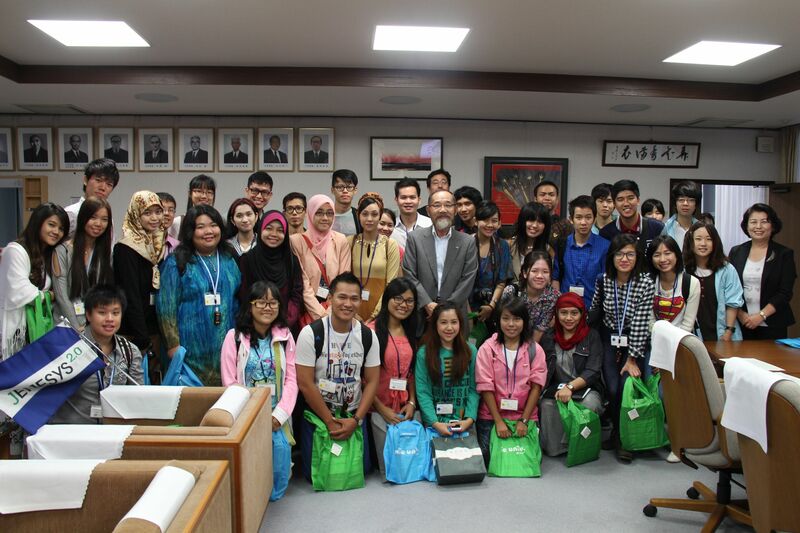 On Wednesday, June 26, Asean Economic Community (AEC) Network Youth visited Mie University. This visit was a part of "JENESYS 2.0," the Youth Exchange Program promoted by Japanese government. Almost 60 college students from ASEAN member countries visited Mie Prefecture. At Mie University, they visited Prof. Atsumasa Uchida, the President of Mie University. The students introduced themselves individually and Prof. Uchida encouraged them to grow friendship with Japanese students, taking the advantage of this excellent opportunity. After the courtesy visit, at Environmental and Informational Platform (MEIPL building), Prof. Hiroki Hori, the Vice Executive President for International Affairs, extended a warm welcome. Prof. Hye-Sook Park, the Executive Vice President for General Affairs Plan and Evaluation, Environment, introduced the activities of Mie University as "the most environmentally advanced university in the world." 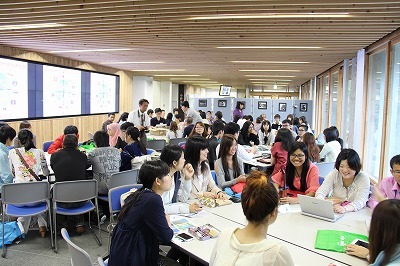 In the following session, they had a workshop on "Cool Japan." In the discuccion, students worked in small groups as follows. Group 1: Air pollution themed on environmental culture; Group 2: Traditional dishes themed on food culture; Group 3: Traditional clothing changing by the times, themed on Kimono; Group 4: Philosophical meaning of Origami in Japan; Group 5: their favorite manga and the impression of trying of Ninja costume, themed on Manga & Anime; Group 6: Presented the culture of their own countries, themed on cultural assets.Concluding the discussion, each group gave presentations with demonstrations such as wearing Kimono and showing the Origami crafts. The students were trying to understand each other, asking many questions or explaining with much gestures. It was stormy weather outside; however, there was a very productive session inside of the building. This program aims to spread the people's interest in Japan and to increase the number of the tourists from abroad. In addition, it is aiming the increase of international understanding to the "Value" of Japan, Japanese brand and its strength and charm, including Cool Japan. It is expected as an excellent opportunity for the future interactive exchange among the young people.